Cambodia under my skin – snackettes. It’s the dry season in Phnom Penh, Cambodia, and a persistent red dust stings my face and eyes as we fly north down National Highway 3 towards downtown; it clings to our sweaty skin, accumulating on the hairs of our arms as a fine, sandy powder. Our tuk tuk driver turns around to face us in the middle of heavy traffic, his helmet perched on his head – unbuckled. “Busy!” he shouts, smiling, as he turns back in time to miss a motorbike careening into our path. From every direction, tuk tuks, motorbikes, and 1970’s-era chrome bicycles fly at us from every direction. The only traffic light that we pass, suffering from a short circuit, cycles from red to yellow to green so rapidly that the street corner looks like a disco. A single policeman attempts to pull up the slack, precariously standing in the middle of hundreds of swarming motorbikes—many of which avoid the clog altogether by driving up onto the sidewalk to continue from there. At the other end of the sidewalk (at least 12 inches above the road below), one motorbike carrying two young men jolts to a halt; the back passenger gets off and locates a piece of cement to wedge up against the gutter, forming a ramp between the sidewalk and the street below. He holds the cement in place while the motorbike drives over it, then climbs on the back and they continue on. Later that day we’re sitting at a small café, overlooking the Tonle Sap River, the lifeblood of Cambodia’s urban centers. A poor, middle-aged man appears on the sidewalk in front of the cafe wearing a faded and ripped collared shirt, tucked neatly into his worn black slacks. Our waitress hands him a day-old, slightly wrinkled copy of the Phnom Penh Post off of the shelf on the wall, which he will try to sell to someone on the sidewalk for anything that they are willing to give– fifty cents, a quarter. A girl no older than 7 wearing a hot-pink dress walks barefoot up and down the sidewalk in front of the cafe, asking foreigners to buy a pirated (photo-copied) Lonely Planet travel guidebook on Cambodia. Day after day we see the same children working on these streets, and it’s difficult to grasp how very different our childhoods must have been. We’ve only been in Cambodia four days, and just being here has already been hard—very hard. I try to make sense of why Cambodia has hit me this painfully, considering that I’ve traveled in developing countries previously; I’ve seen similar types of begging, comparable levels of poverty, this amazing sense of resiliency-in-the-face-of-adversity before. The difficulty for me, I have come to realize, has much to due with Cambodia’s recent past, specifically the upheaval of the country’s entire infrastructure in the late 1970’s. Forty years ago, Cambodia was on par with its now-richer neighbor, Thailand, in terms of commerce and development. Then in 1975, fellow Cambodian Pol Pot and his Khmer Rouge army carried out a senseless and brutal restructuring of the country’s society which ended in the murder of over 3 million Cambodians—over 1/4 of the entire population of the country. To pay tribute to the people of Cambodia, we visited the site in Phnom Penh called Suol Teng (also called S21), where many people were tortured and held prisoner in an old high school that was converted into a prison by the Khmer Rouge. 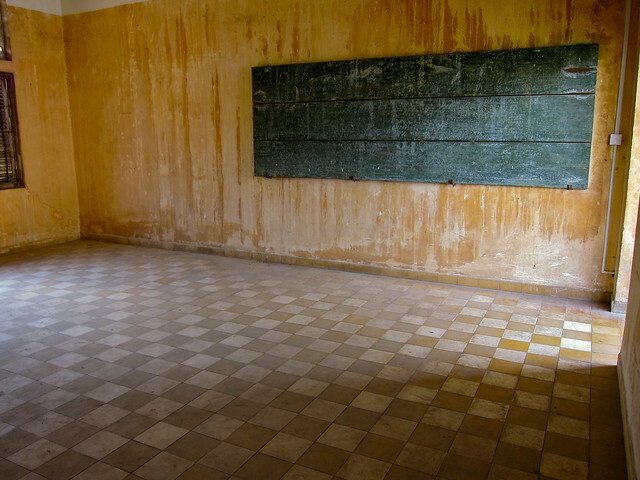 Bricks and wood were used to divide the classrooms into tiny, dark cells, and the school’s wiring was repurposed for use in electric-shock torture. Over time, these political prisoners were transported to a site farther out of town called Choeung Ek (one of the many “Killing Fields” across the country), where over 20,000 Khmer people were mercilessly bludgeoned to death and buried in mass graves. Much of the S21 prison and the Killing Fields have been left exactly how they were in the1970’s, with the mass graves still containing the bones of those buried there, and blood stains permanently blemishing the walls of the old high school. Most disturbing of all of this to me was the way that the innocent Cambodian people were very systematically accounted for by the Khmer Rouge, starting from their expulsion from Phnom Penh, to their photo documentation upon arrival at S21, to a final photo of them after they were killed. All of these horrible photos – before and after – are on display at S21. 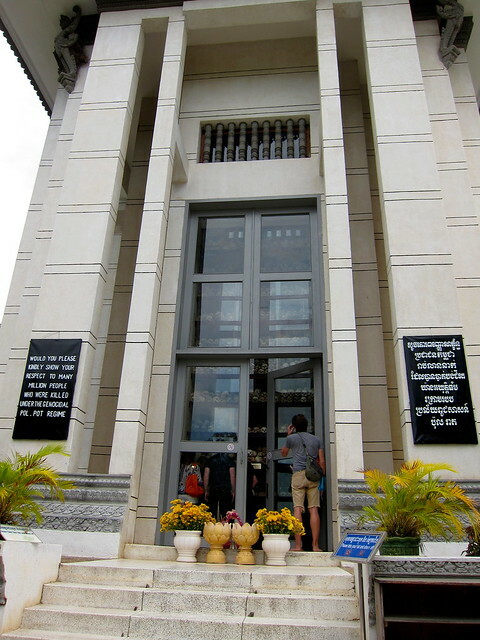 On one wall, the individual photos of the men and women soldiers of the Khmer Rouge stare directly across at the opposite wall a few feet away– a display case showing the photos of their victims, fellow Cambodians. I look from one wall to the other, thinking about how it is not possible to distinguish between the face of a victim and the face of a murderer. What cruel fate could determine how this woman was on this wall and that man on the other? By the time of the ousting of the Khmer Rouge in 1979 by the Vietnamese, only 7 people out of 20,000 prisoners at S21 had survived. The Khmer Rouge had become a killing machine. In particular, during the rule of the Khmer Rouge, anyone viewed as an intellectual, including doctors, teachers and even persons wearing glasses, was immediately killed. Therefore, what Pol Pot and the Khmer Rouge effectively did was not only end millions of innocent lives; they completely disrupted all forward progress in the country, destroyed all means of healthcare and education. Cambodia was a blank slate, a pre-medieval state forced to build anew, to construct itself again from nothing – worse than nothing. Today, there are only three doctors for everyone 10,000 Khmer people. Three. In a country plagued by devastating third-world diseases such as malaria, dysentery, and multidrug-resistant tuberculosis: three. How easy it is for the tears to come at the most unexpected times here: in the Genocide Museum, certainly, but also again this morning while sitting in the café with my fancy laptop and $1 coffee, watching Cambodia pass by on the sidewalk: a man shuffles by us on his knees, both of his feet missing at the ankles—the result of stepping on one of the many mines that were planted by the Khmer Rouge that still dot the country today. Another man walks directly up to our faces, begging, and stares at me with just one lidless, bugling eye, the skin of his face literally melted off of his bones by an explosion. My heart bleeds for these people who have seen, and frankly been through, too much. You can’t help but look at every Khmer person – old and young – and know that, in some way, they have been affected by the tragedy of their country’s past. They each have a story. Stories that don’t make the news. Stories that are a mere smattering of surely hundreds of similar stories of adversity and trial. How different might Cambodia be today if it weren’t for the events of April 17, 1975. Would this same little girl in the hot-pink dress be wearing shoes and attending school today? Would these men still have their legs, theirfaces, so that they might find suitable jobs? Thinking back on all that we have seen, and all that I have borne witness to here, it might be easy to write off Phnom Penh as an entirely depressing place; certainly no one can wander these streets and not feel something for the people who are suffering. Surprisingly though, in many ways Phnom Penh feels like a very happy and active city. Much of the city has been revitalized and is prospering—gorgeous cafes line the riverside area of the city and locals gather every morning to slurp down big steaming bowls of spicy noodle soup at Restaurant 126 near our hotel. From the man who strolls the sidewalks trying to sell the Post, to the boy who delivers coffee to our table, many people are overcoming the trials of life that they have been dealt and are eeking out a living in any way they can. In fact, all of the young people that we have met thus far speak excellent English—a sign of education and of the opportunity to one day work in the tourism and hospitality industries. Indeed, the hospitality here has been exquisite—young people working in the restaurants and cafes address us “Hello sir! Hello miss!” and later, “Did you enjoy your meal?” In fact, one of the most successful programs run by many of the local NGOs here has been to train orphans and street children so that they can one day work in the hospitality industry as waiters, hairdressers, and barbers. For lunch one day, we eat at a small café that employs many of these young people in training. Our waiter, a young man of 20 years old, appears wearing a spotless white T-shirt reading “TRAINEE” on the front, a huge smile on his face. Clearly he has been told that it is customary to be very welcoming and engage the customer in some small talk before taking their order: he addresses the two of us “Hello Ladies and Gentlemen!” and then lingers a bit too long at our table to chat (until our food arrives at the table, in fact). Later that evening on a dirty, busy side street, we walk past a white wooden sign with blue Khmer lettering and below it the word “Haircut” painted on the sign. Three barber chairs are lined up on the sidewalk, and a young man around 20 years old smiles as we pass saying, “Hello! Haircut, sir?” Scott has been wanting a trim, and so he sits down in the young man’s chair. For $2, the barber spends the better part of an hour cutting Scott’s hair by hand – no electric razor here – meticulously double-checking that the cut is flawless, circling around, more trimming, more double-checking that everything is even, is absolutely perfect— and of course, in the end, it is. For him, cutting hair is not a part-time job that he does after school; cutting hair will mean his livelihood, and he is becoming an artisan. As I sit and watch this man literally shape a better life for himself, a tiny boy toddles past me, barefoot and naked from the waist down, alone on the edge of the filthy street. A motoscooter carrying a family of four drives by, and the kid on the back with the faded purple shirt is laughing and he flashes me a smile as he flies out of view forever. Perhaps it’s simply the warmth of the setting sun that hits my arms through the large yellow umbrella where I’m sitting, or the dust that swirls and beats at my uncovered legs, but it’s as if my veins suddenly fill up with this warmth that courses throughout my body and sends chills running down my arms at the same time. It’s this feeling of wonderment and frustration, mixed with unfamiliarity and yet homeyness — this feeling of just being alive. Tears well up in my eyes, and Scott catches my gaze from where he still sits and smiles curiously at this sudden show of emotion. Are they tears of helplessness? Tears of hope? Even I can’t tell. They are simply tears for Cambodia. Tears that have been pushed out, from within. WOWWWWWWWWWW Very sad and powerful writing! Your words painted a picture like a brush in the hands of an artist! This blog must become a book – it will be a Best Seller for sure!